A couple weeks ago, my brother Max sent me his resume in a text message, and asked me to ‘spruce it up a bit’ for him. Undoubtedly, I needed to do more than copy-and-paste the text into a Word document. To truly stand out, I knew the resume needed to demonstrate a level of professionalism and effort — something content alone can’t always convey. Looks a little better than a text message, doesn’t it? To ensure you can create a resume for free, we’ve compiled this list of the five best free resume builders we’ve discovered. Keep reading, and then get to work designing your own — trust me, with these tools, it’s almost as easy as sending a text. Resume Genius is undoubtedly one of the easiest and fastest free resume tools you have at your disposal. With a clean and easy-to-use interface, the tool walks you (speedily) through categories including education, work experience, and references, and offers eight different templates varying from ‘Taj Mahal’ to ‘Classic’. 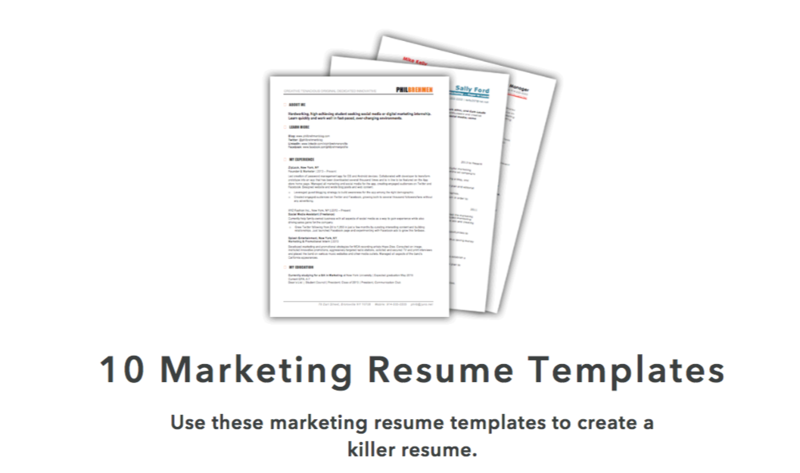 Resume Genius provides you with easy fill-in-the-blank sections, so you can have an impressive, comprehensive resume in no time. My Perfect Resume also enables you to include optional sections like certifications, accomplishments, and affiliations, which is vital particularly if you’re just starting out, or switching industries. This tool is particularly useful if you’re applying for a creative role and want to add color or a unique design to your resume. To use My Perfect Resume for free, click “Download” on the left toolbar once you reach the final step of the builder — instead of selecting “Save and next”. Then, choose “Plain Text (.txt)” to download your resume for free. Standard Resume allows you to import your information straight from LinkedIn, making it an ideal time-savor if your LinkedIn profile is up-to-date. Plus, the white background and minimalist features enable you to focus on what really matters — your content. You can switch back and forth between “Write” and “Design” to see how your resume looks as you go along, and download as a PDF when you’re finished. Best of all, the tool also makes your resume mobile-responsive, so you can view it on your smartphone. If you’re applying for a creative role or want a resume that truly lets you stand out, you might consider using one of Canva’s hundreds of free, designer-made templates. Canva’s selections are incredibly varied and unique, so you’ll undoubtedly find one you like, and inputting resume sections can be as easy as copy-and-paste. Additionally, the templates are separated into categories, such as ‘Graphic Design’, ‘Corporate’, and ‘Creative’, making it easier to choose based on your preferred industry. Creating an Indeed resume is an incredibly quick process, and best of all, the site allows you to automatically share your resume with employers on Indeed as soon as you’re finished. If you’ve already completed a resume, it’s still a good idea to upload to the site for exposure to potential employers. While it admittedly doesn’t offer as many options for creativity as some of the others in this list, Indeed is an impressive option if you want to create a more traditional resume and start sharing it immediately.